I first came across J-H Rosny aîné in a Damon Knight anthology many years ago, and immediately fell in love with his work. This review of three of his novellas was first published in Interzone 241, July-August 2012. The Belgian author Joseph-Henri Boëx, who used the pen name J-H Rosny aîné, belongs somewhere between Jules Verne and H.G. Wells. Like Verne, he wrote swift-paced adventures; like Wells, he had a profound interest in evolution which he incorporated into rigorous science fictions. His standing in the history of science fiction should similarly lie between those two contemporaries. But most of his work is unavailable in English, and his name is probably unknown to all but a few historians of the genre. Such oblivion is undeserved; his writing was vigorous and engaging, and at its best extraordinarily original. It is to be hoped, therefore, that this new collection of three of his short novels might help to make his work more widely known. The novellas – The Xipéhuz (1888), Another World (1898) and The Death of the Earth (1910) – represent both the range of Rosny’s work, and also the themes he would return to again and again. The Xipéhuz is set in prehistoric times, a setting that enjoyed a vogue in French language fiction in the late 19th century, though this story is far from the caveman epic such a description might suggest. Another World is set in contemporary Holland; while The Death of the Earth takes us into the far future. Rosny handles such variety with equal facility, and yet each presents something very different from what we might expect to encounter in such stories. Part of that difference stems from what is consistent in each of these stories. All centre upon a character at odds with his own society. In The Xipéhuz this is Bakhoun, who stands out from his primitive society by living alone, and who effectively invents writing. He provides, in other words, a modern perspective on the events in the ancient world. Similarly, Targ in The Death of the Earth is a man of hope and action in a society that has just about given up on both, so again he gives us a modern perspective on this far future world. In contrast, the narrator of Another World stands outside our society because he is a mutant: he has been born with purple skin, he sees in a different spectrum, and his speech and actions are faster than normal human beings, so fast that he cannot normally be understood. Yet, in the rural society into which he has been born, he stands out as a man of science, patient and careful in his observations, so again he serves as a link with the knowing reader. But it is not just the nature of the central character that links these stories, but the way that each centres on an encounter with the alien. In The Xipéhuz it is strange creatures, shaped like cones or cylinders, who appear mysteriously where a nomadic tribe is about to make camp. The forms prove to be aggressive, and the story tells of Bakhoun’s inventions and battles as he attempts to preserve the Earth for humankind. In The Death of the Earth there is no possibility of such preservation, the planet’s water has nearly all gone and only a few isolated communities huddle around their precious reserves. But in the deserts between these communities a new race has arisen, the Ferromagnetics, not yet fully conscious but clearly destined to be the inheritors of the Earth. Targ’s struggle is to preserve something of humanity in a world where humans no longer belong. The best of the three stories, to my mind, is Another World, in which our narrator struggles to find someone who can understand him, while at the same time observing an entire ecology invisible to humans. The Moedigen, as he calls them, are cone-shaped or cylindrical, but unlike the Xipéhuz they pose no threat to humanity for they are as unaware of us as we are of them. 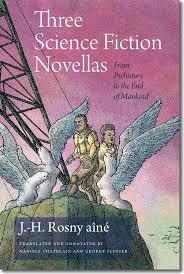 This marvelous invention of a parallel ecology marks Another World, and Rosny, as one of the true originals of science fiction.